Depending on who you talk to, you’ve probably heard different stories about running your SAP environment in a public cloud like Google Cloud Platform, Amazon Web Services (AWS), or Microsoft Azure. These stories can vary from “it’s not supported yet” to “it’s really easy and it’s cheap” - neither of which are accurate. Let Managecore cloud-certified architects assess your SAP landscape and help you determine if the public cloud is right for your organization; and if so, which public cloud is the best for your needs. It's important to remember that public clouds alone are not a complete outsourced solution. They are simply an infrastructure solution (like IaaS). By moving SAP (or any application) to a public cloud, the operating system, database and application still need to be managed. That's the Managecore difference. With our public cloud offering, we use public cloud options along with our bundled managed service to create a complete outsourced solution for your SAP landscape in the public cloud. Unsure of which public cloud is right for your organization? Managecore can provide the guidance necessary to make the right decision. Whether running SAP on AWS Amazon Elastic Compute Cloud (EC2) instances, Google Compute Engine instances, or Azure Virtual Machines, Managecore can architect and deploy the solution that is right for you. These days, most SAP applications are supported to run in public clouds including ECC and S/4HANA. However, there are still a number of points to consider before moving your SAP environment. 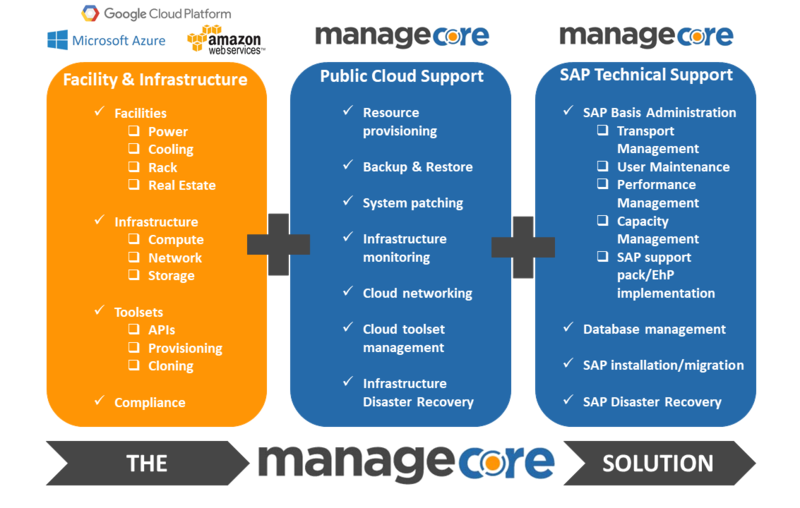 Managecore can work with you to make the right decision, properly configure the public cloud, migrate your systems, and provide you with ongoing support for your entire environment. Let's talk about how you can be more confident in your systems today.